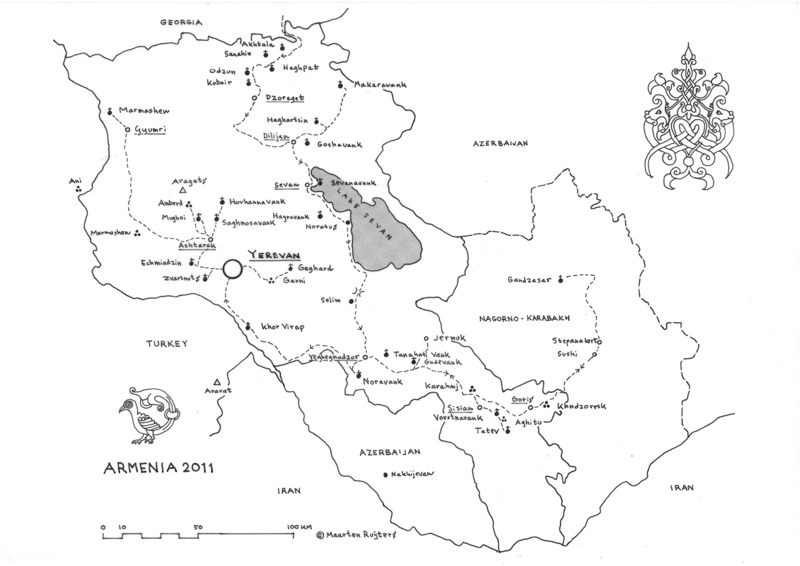 Armenia is situated at a cultural, historical, and religious crossroads in the southern Transcaucasus. It is landlocked and has been reborn after the collapse of the Soviet Empire. It is interesting, surrounded by mountains and often antagonistic neighbours, and full of kind welcoming people eager to advance their country and proud of their Christian traditions and culture. This small country is a welcome addition for globe trotting travellers. You would be particularly fond of medieval buildings such as monasteries or fortresses in spectacular scenic settings and having a pleasant walk to get there adds to the enjoyment. Despite its accessibility by a good road and despite the number of tourists who go there, Noravank with its splendid setting and wonderful carvings is a must-see. Consider seeing churches and other religious buildings, that are built more than 1700 years ago. Such constructions are almost everywhere. One particularly interesting Church is in Khor Virap, located a short drive from Yerevan. Close to the Armenian-Turkish border, this ancient monastery is a perfect place to observe Mount Ararat in its full beauty. Other fine sites accessible to tourist buses are the monasteries of Haghpat, Goshavank, Amberd (together with its adjacent castle), Selim caravanserai, the field of khachkars at Noratus and the prehistoric stones at Karahunj. The final stretch of road to the monastery of Marmashen is in such poor condition that it is not really suitable for large buses, but this may change once construction of a small hydroelectric scheme is finished. Tatev in its dramatic setting gives a good idea of the layout of monasteries and can now be reached by the worlds longest cable car ride. However, my favourites are the wonderful carvings at Makaravank, the fortress of Smbataberd on its ridge (which makes a fine walk combining it with Tsakhatskar Monastery), Khuchap and Khorakert monasteries, Spitakavor Monastery (best to walk up the gorge), Akhtala Monastery (with its wonderful frescoes), Kobayr Monastery (short uphill walk), Hnevank (especially in early summer when the flowers are in bloom - short walk), the petroglyphs on Mount Mets Ishkhanasar (4x4) and the monastery of Gndevank approached along the old road from the north (walk or 4x4 if there haven't been recent rockfalls). A good way to trace through the history of Armenia, the Armenia Heritage Trail is a suggested itinerary of places which takes you on an approximate chronological tour of the long and rich history of Armenia. The route starts near Yerevan, heads almost straight up to the northern border, then loops back to Yerevan from the east. NOT TO BE MISSED: In October 2010 Armenia launched the world's longest cable car line, a 3.5-mile engineering feat that spans a spectacular gorge to the country's ancient Tatev monastery (Armenia's southern mountains near the border with Iran). Tramway takes 25 passangers and the passage to Tatev Monastery takes 11 minuts. The cable car travels at a speed of 23 miles per hour and a one-way journey takes 11 minutes. Two way ticket price is about 7 euro. At its highest point the car travels 1,056 feet above ground. The link allows year-round access to Armenia's ninth-century Tatev monastery complex, one of the country's most important religious centers and a major tourist attraction. Cable car line runs from the village of Halidzor near a highway connecting the Armenian capital Yerevan to the village of Tatev, within walking distance of the monastery. It has two cabins, each capable of carrying up to 25 passengers. Local residents will be able to ride the cable car for free while others will have to pay 3,000 Armenian drams. The Sandia Peak cable car in the U.S. state of New Mexico, which runs 2.7 miles, had previously billed itself as the world's longest cable car line. Erebuni - Urartian fortress which established the city of Yerevan in 782 B.C. Cave in Khosrov - (optional) Cave deep in Khosrov Forest State Preserve with pre-Christian inhabitation. Garni Temple - First century Roman temple in Garni village. Khor Virap - Monastery at the foot of Biblical Mt. Ararat, where St. Gregory the Illuminator was imprisoned in a deep pit until he converted the Armenian King and thus nation to the first Christian country in the world. Dvin - Ruined capital of Armenia. Echmiadzin (3 main churches) - Seat of the Catholicos (Patriarch) of the Armenian Church. Oshakan - Church where Mesrop Mashtots, inventor of the Armenian Alphabet in 405 AD, is buried. Ashtarak churches - The town of Ashtarak has some very old churches, including Karmravor, Marianne, one more rebuilt church, two in ruins and an old bridge. Hovhannavank/Saghmosavank - Two very fine monasteries perched on the edge of the cliffs of the Kasagh Gorge, within distant view of one another. Kasagh Basilica - Ancient black basilica in the town of Aparan. Odzun - An advanced seventh century basilica in the village of Odzun. Haghpat/Sanahin - Two extensive UNESCO World Heritage Site monasteries in villages overlooking the Debed canyon. Kobayr/Akhtala - Two beautiful monasteries with great frescoes showing a heavy Georgian influence due to the intertwined rulers at the time. Mikoyan Museum - A museum honoring two brothers born in the village of Sanahin, one of whom invented the MiG fighter jet and the other served as Chairman of the Presidium of the Supreme Soviet in the 1960s. Ijevan - Small museum dedicated to the coming of Soviet rule to Armenia. Also has nice traditional town architecture. Dilijan (lay architecture - pre-soviet and soviet) - Nice traditional town architecture. Dilijan (Sanatoriums, cinematographers house, other Soviet architecture) - Also home to many huge Soviet sanatoriums, some are pretty cool 70s (cinematographers house), some massive classical (Lernayin Hayastan resthouse). Republic Square/Yerevan Opera House - Yerevan was the focus of the Soviet building effort in Armenia, and Republic Square is a massive square with huge buildings full of columns, carvings and nice stone. The Opera House, from the very early Soviet period predates the real Soviet style of architecture. S. Grigor Luysavorich Cathedral - Massive post Soviet cathedral. Northern Avenue - Large pedestrian avenue linking Republic Square to the Opera area which demolished all the old buildings in its path. Other options off the route: The following sites are off the route, or out of order for this route, but are listed since they help fill in for periods which are not as well-represented as others. Armenia has a huge potential for visitors. Not just for general sightseeing, although its spectacular gorges and medieval buildings certainly provide plenty of excellent opportunities for that, but also for activities such as hiking, birdwatching, architechtural tours, historical visits, botanical trips, angling, horseriding and caving. Its people are overwhelmingly friendly, helpful and welcoming. Few visitors to Armenia leave disappointed apart from wishing that they had had more time in the country.